From the vicinity of Mt. Ararat...the cradle of civilization and the ancient land made famous by Noah's Ark...ak-mak Bakeries brings you the Original Armenian Cracker Bread - ak-mak-the Cracker Bread with a 3,000 year history. As a health conscious consume, your health and that of your family and friends is surely of great importance to you. Undoubtedly you know that wheat is a good source of protein. You may be wonder if ak-mak crackers, which include certified organic whole wheat flour as their main ingredient, are nutritious? 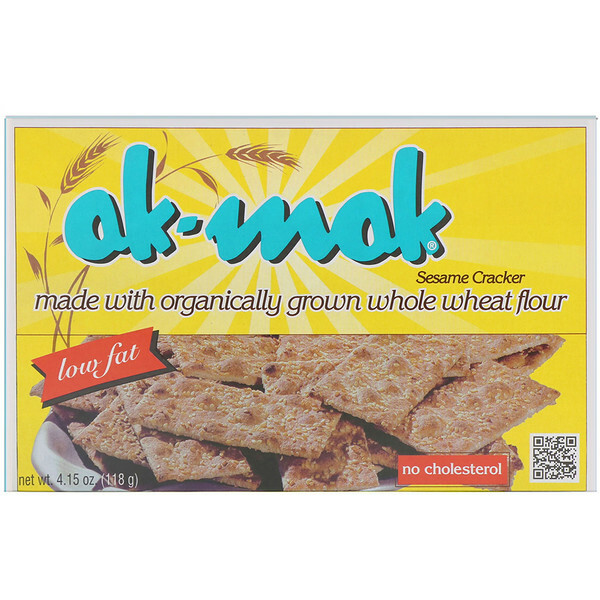 Do ak-mak cracker have any nutritional valuye for you and your family? Consider the following then you and your family can decide. Rice is, and has been for many centuries, the staple food of the people in the Far East. Corn and beans have been the staple food of the South Americans. Wheat, on the other hand, has been the staple food of the Armenians, Greeks, Romans, and Holy Land people for thousands of years. In Biblical times, it was considered in important part of the diet: Genesis 18:6; 42: 1, 2 show that the ancient peoples considered cereal grains to be vital to their way of life and living. In modern times, we have come full circle. USDA's MyPlate program has determined that cereal grains are part of a healthy diet. The MyPlate program, essentially acknowledges the intelligence of the ancient people. Throughout the decades, we have been committed to making the best whole wheat sesame cracker possible. We begin with certified organic high-quality wheat, whole of the wheat, that is ground into flour: this flour, and only this flour, is used in manufacturing our excellent whole wheat sesame crackers. Our commitment to high-quality crops and on our 'old-style' recipe can be seen on our short, clean, non-gmo ingredients lists. Our family has been carrying on that long Armenian baking traditional in the United State since 1893. That was when our great uncle Jacob opened his Armenian bakery in Lowell, Massachusetts. Since 1983...four generations of the Soojan family baking the U.S.A.
Organically grown whole wheat flour, clover honey, sesame oil, dairy butter*, sesame seeds, yeast and salt. *Adds a dietary insignificant amount of cholesterol. 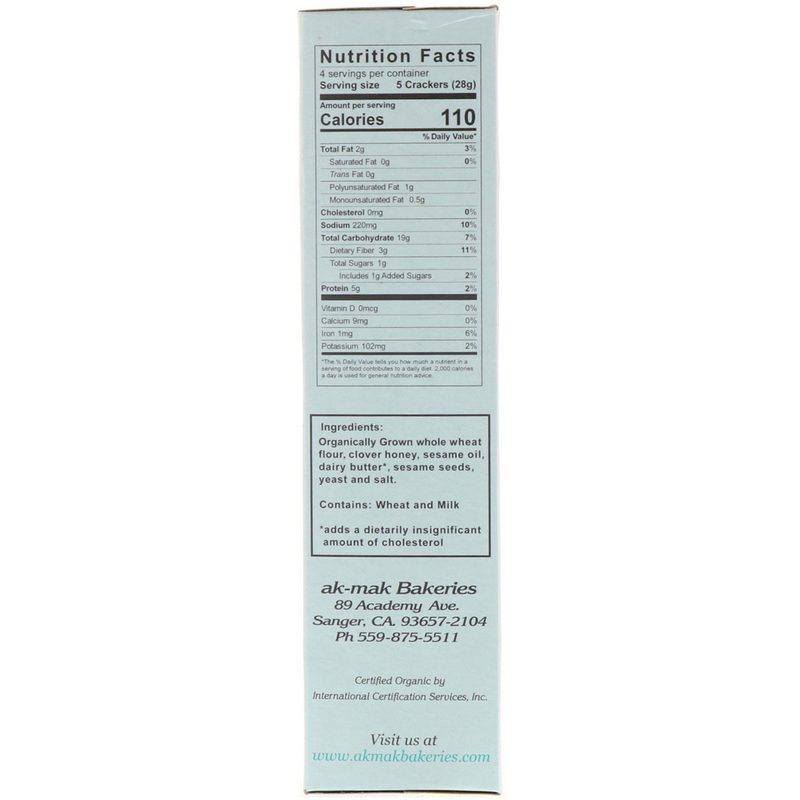 *The % Daily Value tells you how much a nutrient a serving of food contributes to a daily diet. 2,000 calories a day is used for general nutrition advice.